Why choose U.S. Bellows for all your expansion joint needs? Do you have a plant turnaround coming up? Do you have a plant turnaround scheduled or planning one in the near future? PT&P is prepared to be there for you throughout the entire process. From planning, to execution, and follow-up, we have what it takes to accomplish a successful plant turnaround. - Contact our quotations department for immediate pricing on pipe supports, expansion joints, or auxiliary steel needed during the turnaround. - Consult our experienced engineers for guidance on support placement, materials, finishes, etc. to ensure optimum life of the supports. - Use our field service team to guide you through installation, start-up, and replacement to safely and efficiently handle your turnaround. - Receive training to monitor the supports, and identify potential failure, in order to prevent unplanned turnarounds in the future. - Learn correct size and selection of pipe supports and expansion joints per application for any post-turnaround resolutions. - Call on our field service team to develop a data book of existing pipe supports and expansion joints and their conditions in order to identify potential maintenance issues in upcoming turnarounds. A rectangular metal expansion joint was refurbished on an emergency basis for a local chemical plant. Upon arrival, it was acid washed and dye-penetrant examined for any cracks. View the full Article. U.S. Bellows, Inc. refurbished two pressure balanced elbow expansion joints with a quick turnaround for a power generation plant during outages. They are designed for high pressure turbine crossover piping. 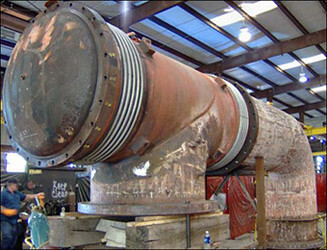 The first 54″ outside diameter expansion joint leaked from a crack in the bellows causing an unscheduled outage. View the full article. This expansion joint was received in the morning and shipped to the customer the very same day. The bellows, liner and cover were replaced and the carbon steel parts were sand blasted, cleaned and painted. A dye-penetrant test and hydro-test to 518 PSIG were performed prior to shipment. View the full article. This expansion joint was received in the morning, refurbished by adding new bellows and limit rods, and then shipped the very same day. New 321 stainless steel bellows were fabricated and the existing flanges were reused by sandblasting and then painting for corrosion protection. View the full article. U.S. Bellows has extensive experience in providing quick turn emergency services during unexpected shut-downs and planned turnarounds. We provide expansion joint on-site services, installation supervision, inspection, problem resolution, repair, refurbishment and replacement. U.S. Bellows has a system of stock bellows and an “on-call” engineering and manufacturing team to meet any of your quick turn and emergency requirements. For the quickest response, use our online emergency form. We guarantee a response to your request within 30 minutes.